The continued growth of big data, both in terms of quality and accessibility, is disrupting a wide range of roles. The skills needed to analyse this data need to be learned by everyone - not just data scientists. By Emily Glassberg Sands, Coursera. The business and societal potential created by big data is astounding. McKinsey’s 2017 Big Data Report estimates of the opportunity in different sectors include a 600 billion dollar value annually from using personal location data, a 250 billion Euro value annually to Europe’s public sector administration, and a 60% increase to retailer’s operating margins. It’s perhaps no surprise, then, that data science was named the sexiest job of the 21st century by the Harvard Business Review and ranked the “The Best Job in America” by Glassdoor. Yet the hype around data science risks overlooking the bigger, broader, and far more crucial trend: big data is disrupting a wide range of roles, from engineering to functional analysts to executives. The explosion of data has created a real and heightened need for new tools, technologies, and methods throughout organizations to harness its value, in turn leaving individuals and companies clamoring for the latest skills to stay productive and competitive in the market. One place individuals and companies learn is on Coursera, an online platform where today over 30 million users come to engage in 2,500 courses taught by top university and industry partners including Stanford, Princeton, and Google. Courses span a range of subjects from data and computer science to business and personal development to social sciences and humanities. For the first time ever in 2017, annual enrollments in data exceeded enrollments in any other subject area. First, when it comes to data upskilling, we’re talking about far more than just data scientists. Across a variety of major functions, individuals are responding to market needs and developing their data skills. Over one-third of learning by software engineers and business analysts is in data, as is a quarter of learning by financial analysts and management consultants. Second, upskilling is happening at all career stages. With the rapid rate of change in the age of digital transformation, learning only at the beginning of our working lives is no longer a viable option. In fact, senior individual contributors and managers are relatively more invested in learning data skills than those in junior individual contributor roles. Third, just as the data opportunity spans the sectors, so too does data upskilling. It’s no surprise that the technology industry tops the chart with over one-third of learning happening in the data domain, but the financial services and information industries are not far behind. Employees in the professional and technical services industries also spend over one-quarter of their learning in data content, and the corresponding figure in retail and healthcare is a healthy twenty-two percent. A question both individuals and companies ask is, “What skills do I need?” While data learning spans roles, levels, and industries, the specific data skills workers are developing varies. 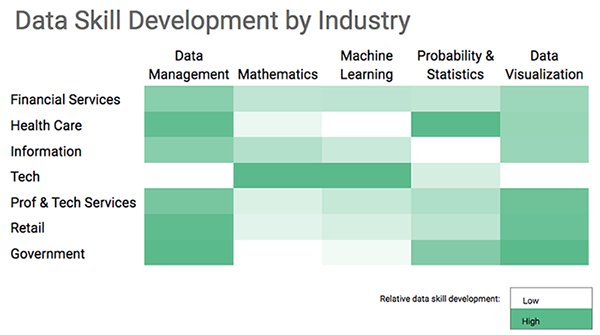 Consider the heatmap below showing relative skill development across industries for each of five key data skills. Machine learning stands out as the most common focus area among learners in data-first industries like tech. Meanwhile, data management is relatively more popular in healthcare and retail industries where the data often lives in legacy systems that demand strong data management skills to unlock. There’s no denying the power of big data to transform products and businesses, but unleashing its full potential requires a cross-functional workforce well-trained in fast-evolving data skills. 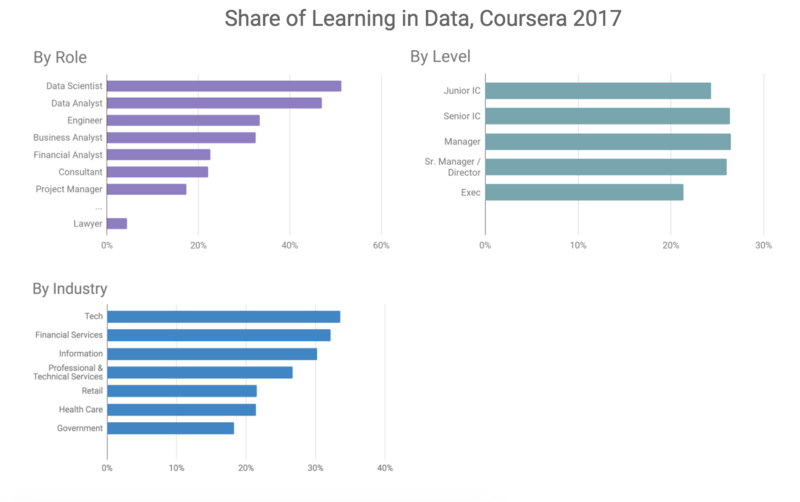 While the media hype around data science is perhaps overblown, the market speaks for itself: across a range of sectors, roles, and levels, millions of individuals on Coursera alone are already engaging deeply with data content; and best-in-class companies like AXA, PayPal, and Infosys are creating and serving curated learning plans on the platform to upskill their talent and unleash the data potential in their respective businesses. The future of work and the future of learning are converging as individuals and employers alike respond to the business opportunities of big data by investing in their data talent. That includes not just the data scientists, but also the engineers and architects, the business analysts and risk analysts, and the leadership all the way up to the CEO. Originally posted at Harvard Business School blog. Reposted with permission.